Our friendly hydrotherapy rehabilitation centre, with two fully-qualified Canine Hydrotherapists, is based in Staplehurst, Kent. We offer specialist hydrotherapy equipment within our two purpose-built log cabins, with heating or air conditioning for your complete comfort. So that you get 100% attention and care for your dog, we pride ourselves on ensuring that your dog will not meet other dogs or clients whilst attending their hydrotherapy session. Your dog will be treated by one of our highly qualified Canine Hydrotherapists, Graham Cooper or Alana Woods. 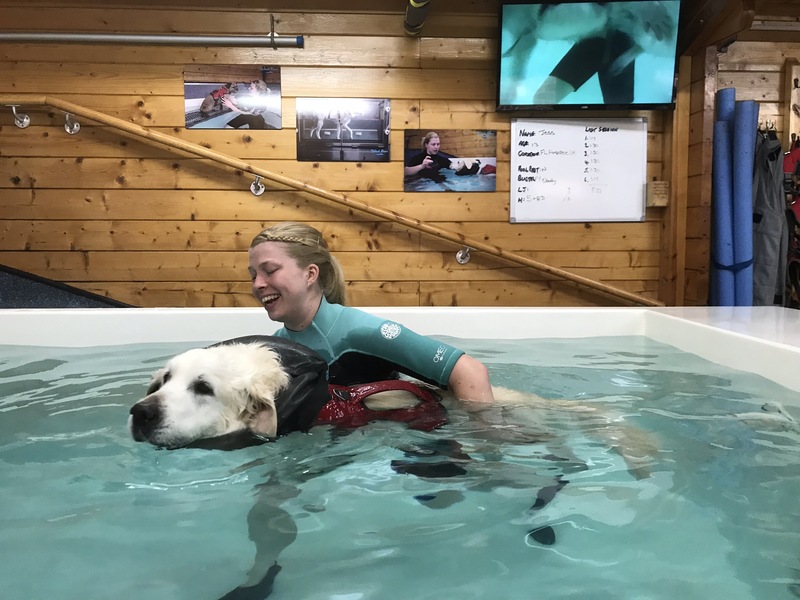 With over 10 years of hydrotherapy experience between them, they pride themselves on a high level of professionalism and care delivered to your dog during their individually tailored hydrotherapy session. Julie Cooper is the third member of the team and your first point of contact to answer your questions and book your Initial Assessment date. My dog was diagnosed with bi-lateral hip dysplasia as a puppy and following consultation with an orthopedic specialist we agreed to try hydrotherapy before considering a total hip replacement. Almost immediately it was evident that after each session Roo was less stiff and much more comfortable. His muscle measurements were taken and over time his muscles grew and the muscles in the weaker hip matched those in the stronger one. The care and attention to detail taken by Graham and Alana is outstanding and they take every action necessary to ensure that Roo gets the most out of every treadmill step at every session. 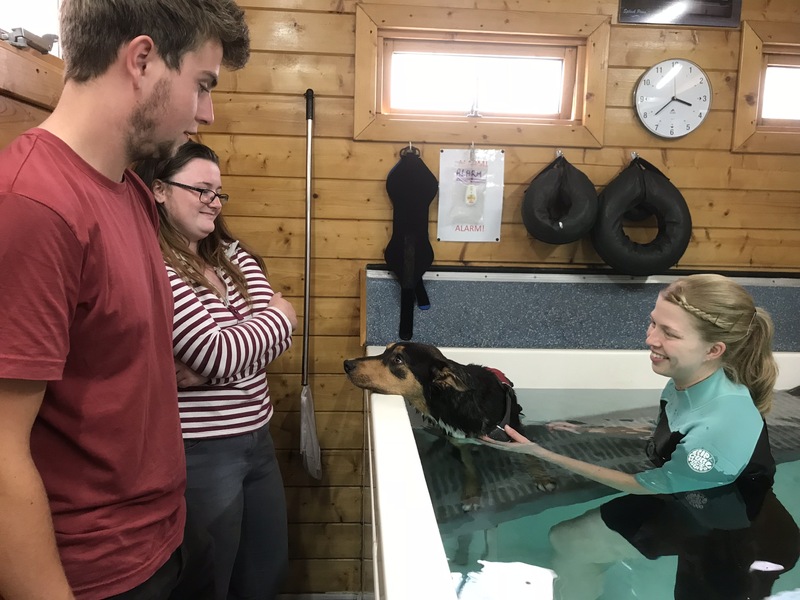 I am convinced that their expertise and dedication has helped keep Roo fit and comfortable throughout the time he has been having hydrotherapy. After 6 years of hydro Roo has now had a total hip replacement but I have no doubt that this would have been necessary several years ago had it not been for regular hydro. He has returned to hydrotherapy as part of his recovery and I know that this will help him to recover quickly. Finzi, our German Shepherd developed mobility issues at just 6 years of age, affecting his hind limbs and occasionally one of the fore limbs. Our vet suggested hydrotherapy might help, so we took Finzi to Splash Paws. A thorough Initial Assessment was carried out and a regular course of hydrotherapy in the Underwater Treadmill was undertaken. 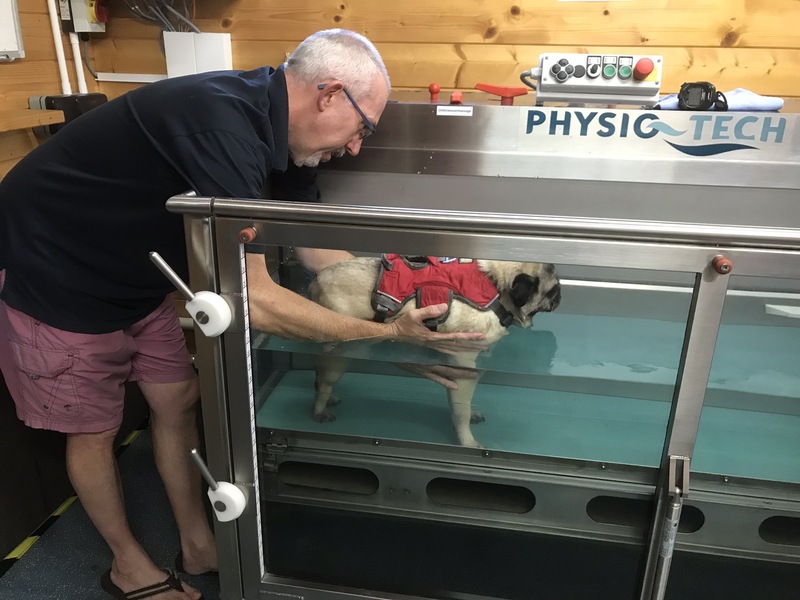 Regrettably, there was no cure for the mobility issue, but the hydrotherapy provided by Splash Paws coupled with their specialist knowledge in mobility issues in dogs, helped enormously, giving Finzi a much improved quality of life. We have no hesitation in recommending Splash Paws for their experience and knowledge, helping any dog with a mobility issue. Scout started going to Splash Paws after she was diagnosed with Elbow Dysplasia. When she first arrived her limp was very pronounced and she was obviously in pain. To say she is now a different dog is an understatement. Graham and Alana were incredibly kind, patient and professional in their understanding of the treatment needed. They clearly take great pride in their work and monitored Scout closely throughout her sessions. Her joints and muscles are much improved and she is now strong, full of energy and most importantly a happy dog once again. It’s been a real pleasure to take Scout to Splash Paws and both Scout and I will miss our visits. We first came into contact with Splash Paws not long after our 9/10 month old Kelpie cross had a Femoral head and neck excision. Despite our vet’s reassurance he would figure out how to use his leg again, it became pretty apparent that wouldnt be the case. Skip forward to our first ever session and we were so impressed with how the team managed him and clearly listened to us about our concerns, worries and what our aims for his future were. Instantly the whole team were very reassuring, explained everything in detail to us and came up with his excercise plans based entirely around our lives. They absoloutly went out of their way to help us fix Mace, worked overtime for sure and were more than helpful even outside of sessions. Fast forward nearly a year Mace sadly had another accident which meant he would have to loose the leg we had all just worked so hard to fix. Splash Paws were just as heartbroken as us, I cannot thank Graham, first and foremost, enough for being there at the end of the phone at possibly the most traumatic event that we’d ever had happened to one of our dogs. He totally reassured us we had done the right thing and was there for anything we needed. One huge, great, big thank you to Alana as well who went out of her way to send us her well wishes and any advice she had for the tricky weeks ahead. Mace returned to hydro a couple of months after his leg amputation and thankfully Alana has built up the most incredible bond with him, meaning he had full and absoloute confidence in her asking him to do lots of new and tricky things. He enjoys every single swim he does with Alana and I cannot imagine entrusting any other business with my dog. He will continue to come here for as long as it may be and not only have all of Splash Paws been a great, knoweledgeable support, they have also become great friends of ours. For everything they have done for Mace, we are enternally grateful!